When John Criswick straps himself in aboard Virgin Galactic's spacecraft, it won't be just for a joy ride. To the Canadian entrepreneur with a lifelong love of space, it will be the pinnacle after years of work in space-related fields. 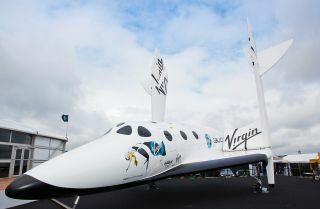 Virgin Galactic's SpaceShipTwo will offer passengers suborbital trips to space, allowing them to experience a few minutes of weightlessness and a view of Earth from above without making a full orbit around the planet. The private suborbital spacecraft can carry six passengers and two pilots, with tickets selling for $200,000 a seat. The initial flights will be based out a new terminal at Spaceport America, a private rocket launching ground in New Mexico. "When I compare myself to someone like Julie Payette ..." he says, trailing off and then laughing, while speaking from his office in Ottawa. Payette, one of Criswick's competitors, was chosen, flew twice in space and is now the CSA's chief astronaut. She speaks six languages and once sang for Montreal's symphony orchestra. But that's okay; Criswick's backup plan is working out well. He eventually left the space industry and began building tech company after tech company. Ultimately, he figured, maybe there was a way he could buy his way to space instead. It's clear when reading through Criswick's résumé how hard he tried to be an astronaut. Canadian John Criswick poses for a photo with Virgin Galactic's WhiteKnightTwo Eve, the carrier aircraft that will launch the SpaceShipTwo spaceliner into suborbital space during his spaceflight. Criswick's credentials include a master's degree from York University, where he studied space physics, as well as participating in the International Space University's summer program. He obtained a pilot's license and has sailed and researched the ocean — skills that still come in handy for astronauts. Between his undergraduate and graduate degrees, he worked with Canadian Astronautics Inc., doing software development on a wind-imaging interferometer, WINDII. That instrument flew on NASA's Upper Atmosphere Research Satellite, which launched in 1991 and fell back to Earthin 2011. Criswick, now 48, appears to have taken the rejection in stride. His philosophy at the time, he said, was to take what he learned and apply those skills to something else. "My time at ISU inspired me to do what I want to do and start companies," Criswick said. Armed with his master's in 1994, he decided to hop onto the Internet craze and see what kind of companies he could build. Two decades later, Criswick has a small empire of companies within walking distance of each other in the Canadian capital's ByWard Market district. The area was once known only for clubs, but today it is also an epicentre for tech start-ups. Among Criswick's holdings, there's mobile entertainment firm Magmic on the fourth floor of one building and technology companies Smoke Labs and Pretzil one floor below. Around the corner is Mercury Lounge, a nightclub Criswick has owned for 12 years. And earlier this year he sold Rove, a mobile IT systems management firm, for $10 million Canadian. In between his long hours, Criswick kept up his interest in space. Peter Diamandis, who founded International Space University, is also the creator of the X-Prize, a series of competitions designed to spur innovation. Criswick and several of his ISU classmates attended the 2004 launch of SpaceShipOne — the precursor for SpaceShipTwo built by Scaled Composites of Mojave, Calif. The craft won the $10 million Ansari X-Prize for the first privately built manned suborbital vehicle to reach space twice within two weeks. Soon after, British billionaire Sir Richard Branson announced plans for Virgin Galactic and the goal of selling tickets for future space voyages within the next year. Around the same time that Criswick "sealed the deal with my girlfriend," who remains his partner today, he also made a long-term commitment to Virgin Galactic. He plunked down 10 percent of the $200,000 ticket price for a [Rise of SpaceShipTwo: Test Flight Photos]. Since making his $20,000 investment, Criswick has been sitting back and patiently waiting for his ride, which originally was expected to launch in 2008. He has no idea yet when he'll fly. In the meantime, Virgin Galactic periodically invites SpaceShipTwo ticketholders to events and tours of various facilities. Criswick, the first Canadian to sign up, has traveled to places ranging from New Mexico to New York, meeting with company officials and potential crewmates. Once he's in space, Criswick has no firm agenda. He says he will make the necessary insurance arrangements ahead of time in case the worst happens, but once it's time to go, "I like not to plan, and let it happen." Right now, the first Virgin Galactic launches for passengers are slated for 2013, following a series of test flights. While Criswick waits, he has another space pet project: He is offering to finance a telescope to be built at Canada's University of Victoria. The idea is still in the early stages, however, and has yet to receive official approval by the university. Criswick's philosophy is that students can't be forced to go to university; they need to have a spark of enthusiasm to do well. For him, the spark was space, and he wants to share that joy with others. He plans to use some of the millions of dollars from the sale of his Rove firm. Some of that cash has already been spent on tech ventures, he said, but he has a sum set aside for the university if it is interested. "Space is infinite. The knowledge is infinite, and the capacity to explore it is infinite ... infinite-ish," Criswick grinned, with a nod to the limits of our current technology. Perhaps "infinite" describes his love of space, as well. Follow Elizabeth Howell @howellspace and SPACE.com @Spacedotcom.We're also on Facebook and Google+.